This bearing, pressed on, prevents the side plate of the frame from coming off, so out came the puller. Finally had the chance to dig into the Honda snowblower this evening which was previously in a collapsing carport (with bonus weight of 2 feet of snow with a couple inches of rain on the roof). As was known, it’s bent. Can see where the bending flaked off the paint and it then rusted in the years since the Flattening; note that it is bent about 1/3 of the way from the top as well as shifted at the bottom. The whole thing should be flat. Now, obviously the handlebars are bent up. This was clear looking at it (find my old post for an assembled picture). I wasn’t sure how deep the damage went. Turns out, it goes pretty deep. 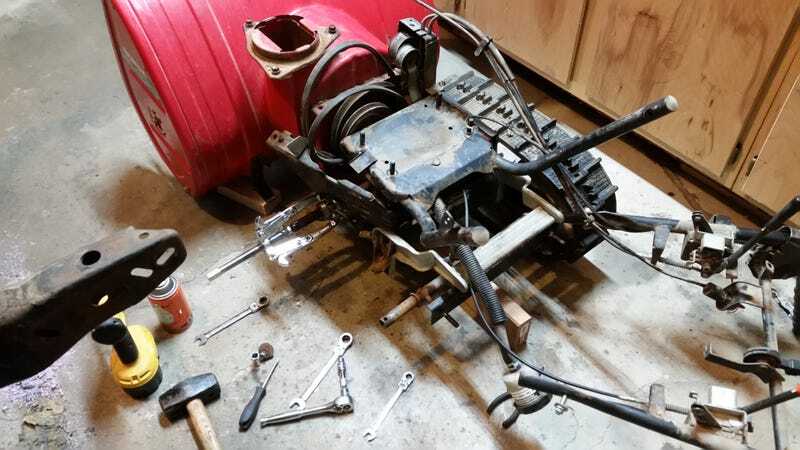 The upper handbars are bent and twisted, the “engine bed” (as the parts fiche calls it) handle mount is bent on a couple different axes (fortunately the main flat/square bit seems to be okay), one side of the frame (pictured to the left if Kinja gets its act together) has buckled, and one of the track guide... frame... things... is twisted. Also the chute is bent but that’s easy (and the dented gas tank doesn’t much matter). So, the frame side needs hammered back straight (and I need to figure out how I’m going to press the bearing back on the shaft once it’s back together), the track frame thing needs twisted, the handle probably needs pie-cut and welded in a few spots (I no other way to bend it, really - it’s heavy tubing), and the chute needs straightened out (that’s the easy part). Then it’s just an oil change and new gas from being ready to go... right?